Advanced technology at your clients fingertips! toxic stressors and many more..
most effective route to optimal health for your clients! 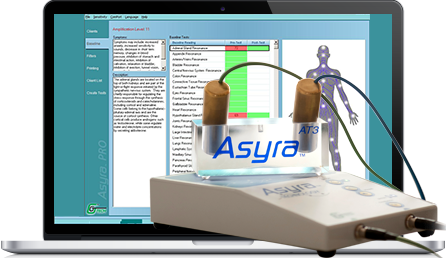 Response testing with the Asyra Pro opens a window on causative factors to form the basis of an in-depth consultation, helping you map out the most effective route to optimal health for your clients. Do you want to get better insights into your client’s health picture? Asyra is the key! 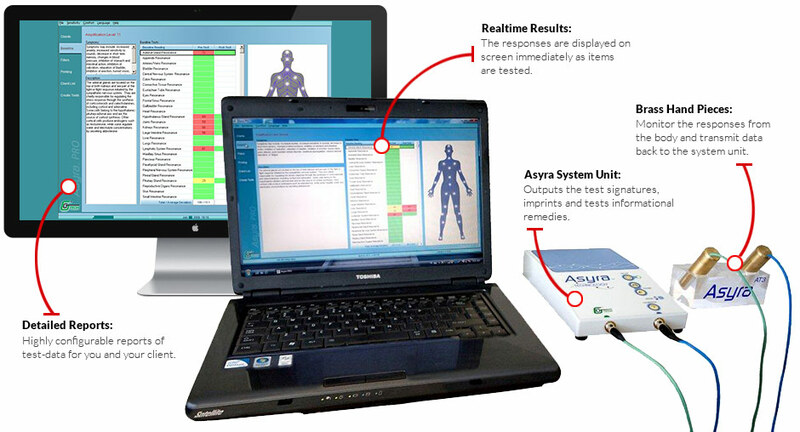 The Asyra system gives you instant responses to help you explore the root causes of health problems, and how to solve them. This is completed in moments, non-invasively, and with no practitioner bias. 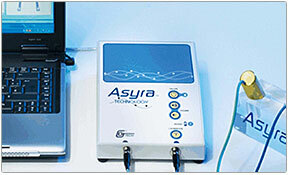 The Asyra Pro is a highly effective tool for any health practitioner! Along with a wide range of tried and tested screening protocols, you have complete freedom to customise and add to the database. The Asyra supports you to recommend the best treatments for each client from among all the techniques and products in your repertoire. The Asyra Pro is the result of decades of continuous improvement in applying the principle of energetic assessment by electro-dermal testing. The features are tuned to take your consultation beyond the limited case-history information revealed by interview. Along with the essential tests pre-configured, you have a wide-ranging database from which to create your own tests and protocols. The software interface is clear and concise, with a visually engaging test process, and PDF reports generated at the touch of a button. With a compact footprint, and fitting into a small case alongside your laptop, the Asyra can easily be moved between practice locations. Asyra lets you and your client see response results straight away, resulting in a more dynamic interaction, and a more complete consultation. Our support options include email, telephone, online user groups, and face-to-face support along with remote online assistance. Your training journey comprises three stages of classroom or online training, backed up by workshops, webinars and individual support. The Asyra grows the appeal of your practice in a number of ways; helping you to identify root causes of health issues and deliver lasting results. Hire or lease purchase can be arranged through trusted third-party finance companies, giving you financial flexibility to grow your business. 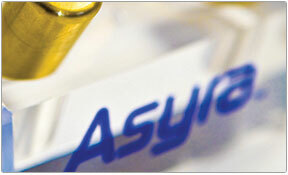 The Asyra database contains a comprehensive range of test items spanning an enormous variety of health disciplines. I’M CONVINCED, GET IN TOUCH! Mark Galloway, developer of the Asyra software shows how to conduct Asyra testing with a client. Includes screen video and stills. 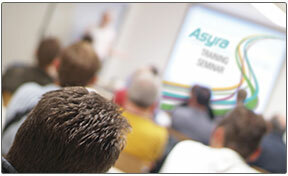 Mark Galloway continues his demonstration, focusing on the capabilities of the Asyra for generating imprinted solutions. Hazel Drummond, an experienced Asyra practitioner, talks through a full client consultation, illustrating different choices in clinical approach. The first of a two part video illustrating the way in which practitioners can use the Asyra bio-energetic health screening device in consultations. 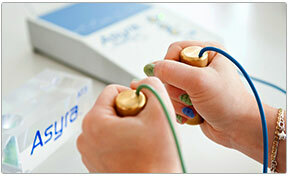 The Asyra is the most flexible, fast and accurate bio-energetic screening device on the market. If you are looking for ways to develop your natural healthcare practice, contact NutriVital Health for more information and a one-to-one demonstration. 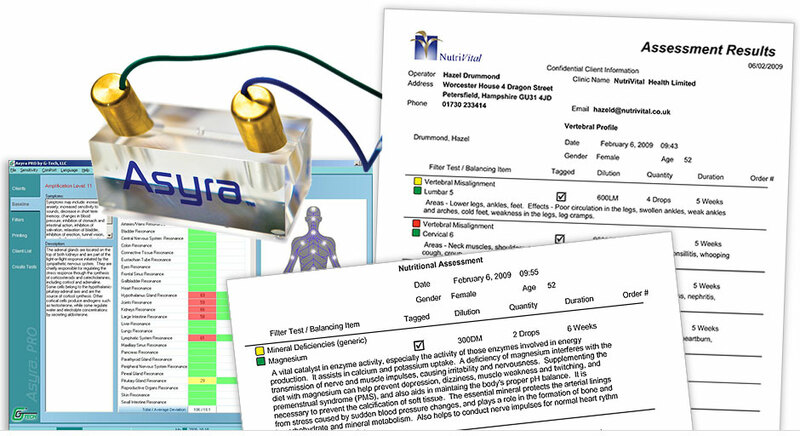 Test results are presented in colour showing items in priority order. 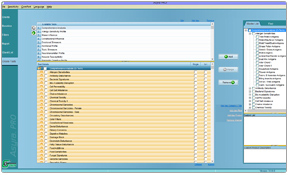 Reports are easy to read and available immediately to be printed or exported to PDF. 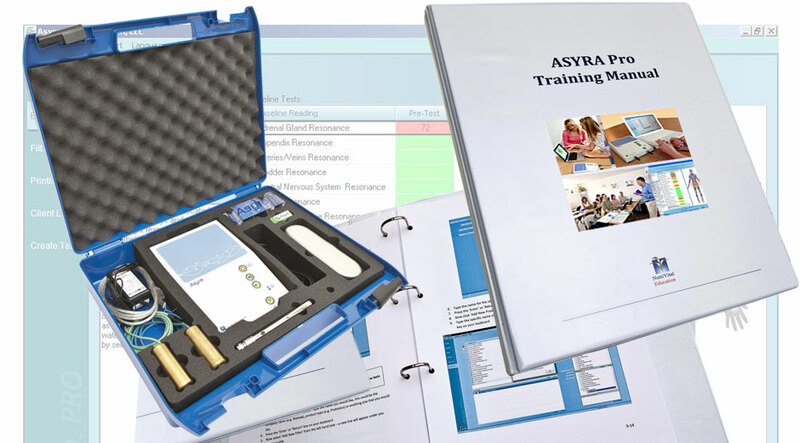 A comprehensive package including classroom training, video tutorials, printed reference manual and webinars ensure that you have all the knowledge you need to get great results. 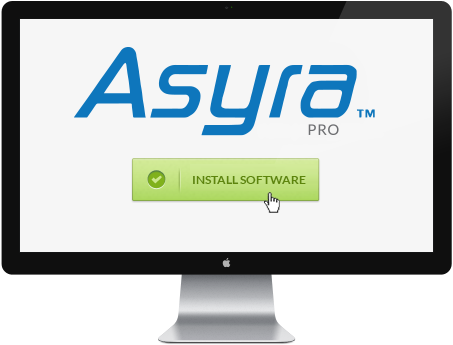 Your Asyra software can be installed on multiple devices. Passing your database from one device to another is quick and easy. User Reviews: Practitioners Love Their Asyra, And Love The Support. Read our practitioner testimonials below to see how the Asyra enhances all kinds of health practices! A recent client had suffered Insomnia for two years, had been to a well known TV hypnotherapist for 6 sessions, and it had not helped. The hypnotherapist suggested a food test, I put in comprehensive and non-linear, non linear showed a need to be increase awareness of neurotranmitter function. I ran the test and guess what came up? Melatonin and Trytophan – all needed to rebalance sleep. After the consultation he rang me to report that he has slept like a baby ever since! I purchased the Asyra as soon as I set up my practice, and I love it. I love how instantaneous (and accurate!) the results are. This means you can pinpoint the root of the clients problems, resulting in a more effective treatment. Clients love it, and it enables you to interact with them in a different way, keeping them engaged throughout, as they love seeing the results and going home with ‘literature’. I get so many queries asking whether I test for allergies and sensitivities, and I genuinely believe that the Asyra method gives an incredible advantage. We specialise in allergies and I use the Asyra to reveal the client’s response to the relevant informational signatures. The results help me prioritise and then I use a homeopathic remedy to treat the client. 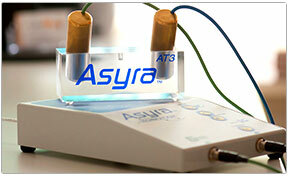 The Asyra is so easy to use and has amazing results. Clients can find it hard to come in and just spill all their problems. They tend to get to the core issues only at the end of the consultation time. The Asyra helps identify issues at their root, rather than simply relying on the client’s descriptions and interpretations. This takes a lot of pressure off the client, and makes them feel more relaxed. Clients also love the shorter testing time, and crucially I’ve been getting excellent clinical results by working in this way. 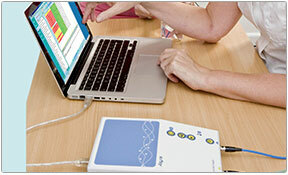 A more engaging consultation and better clinical results have made the Asyra a really valuable piece of equipment for me. I’m glad I chose the Asyra. The reason I got the Asyra was to offer more to patients, as it gives so many more ways to look at their health holistically. They love the interaction of seeing what is happening, which helps their compliancy rate. Often there is so much more underlying things, and the Asyra often offers “the missing piece” in their health. The support from Asyra staff has been amazing, and Hazel is a dream to work with, always understanding and informative. All I can say is I’m a fan, it’s helped build my practice, thanks Asyra and team! Join the ever growing network of satisfied Asyra Pro users!